Our pigs cause us concern from time to time from not eating, limping, the odd lump appears, piglets having diahorrea, they get in to a little tussle with their fellow companions which can then result in minor scratches to a deep gouge. Then we are faced with the regular medication to ensure the health and well being of our pigs. But in all cases your first port of call is your vet. As you all know, from my posts and attending AHDB Pork meetings, important steps have already been taken to cut antibiotic use: the meat poultry industry almost halved its use of critically important antibiotics from 2012 to 2015 by improving training, stewardship, stockmanship and disease control. And again as we all know, AHDB Pork, the UK pig industry has launched a successful online system to record, benchmark and control antibiotic use, which already contains data for quite a few pigs. All vaccines used in pigs have a shelf life and as biological products are susceptible to degeneration. Storage is normally required under refrigeration – without freezing – and in the dark. Never use products that are out of date or have not been stored correctly. Each specific vaccine has a specific dose rate and administration protocol that must be followed if the vaccine is to be effective. Erysipelas – Breeding animals should always be vaccinated for Erysipelas with a two dose primary course e.g. in the gilt, with booster doses given every five to six monthly intervals. Sows two weeks before farrowing. Don’t forget boars. Growing pigs, where necessary, can be vaccinated from six weeks of age. Sow vaccine (Circovac). 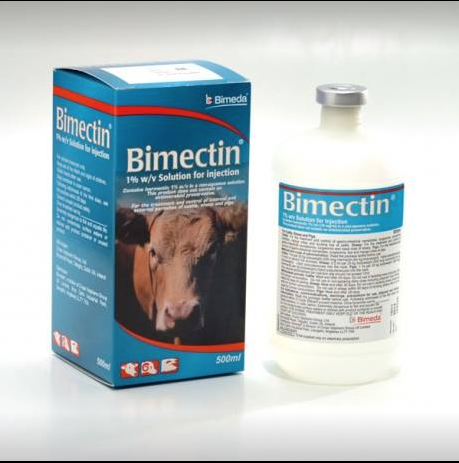 Similarly to E.coli/Clostridial vaccines, this is administered to breeding animals prior to farrowing to protect the young piglets via colostrum. Two doses with an interval of three to four weeks are needed, with the second dose two weeks prior to farrowing. (Gilts may also be vaccinated prior to service.) 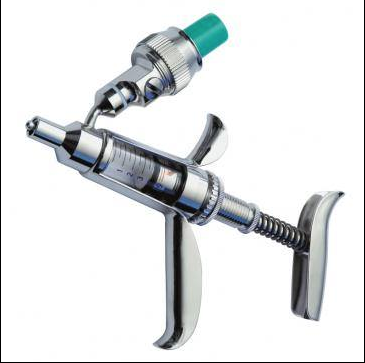 Single booster doses are required at least two weeks prior to each subsequent farrowing. It should be noted that this vaccine comes in two parts, which must be reconstituted and used within three hours. Some vaccines are available as specific combinations (e.g. Erysipelas/Parvovirus) but in some cases uncombined vaccines may be required at similar times. As a general rule, NEVER mix vaccines (unless specifically recommended) and do not apply simultaneously. 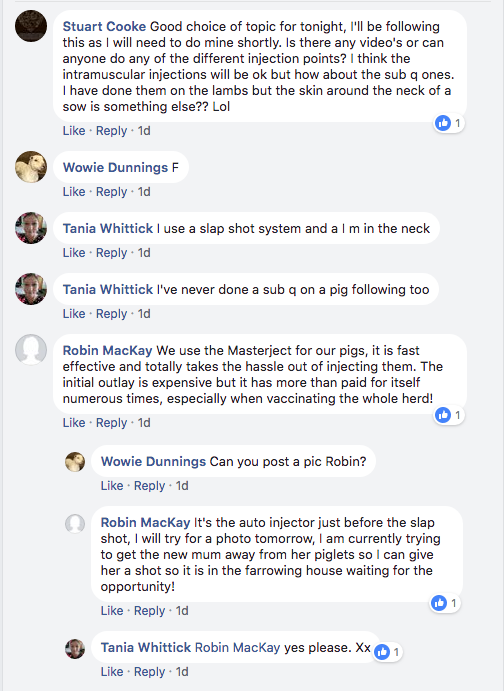 This can be challenging if young piglets require several different vaccines and advice should be sought from your vets. Most of us keep Pen & Strep, this treats infections caused by, or associated with organisms, sensitive to penicillin and/or streptomycin. 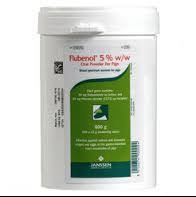 It will therefore be effective in the treatment of infections caused by susceptible organisms including: Erysipelas; navel/joint ill; respiratory tract infections including pneumonia and atrophic rhinitis; listeriosis; meningitis; septicaemia; toxaemia associated with mastitis; urogenital tract infections; enteritis associated with Salmonella spp., salmonellosis; and the control of secondary bacterial invaders in diseases of primary viral origin. Also, most of us keep Metacam, which contains the active substance meloxicam, which is used in non-infectious locomotor disorders (diseases that affect the ability to move) to reduce the symptoms of lameness and inflammation, for the relief of post-operative pain associated with minor soft tissue surgery such as castration, and for supportive therapy together with appropriate antibiotic therapy in the treatment of diseases that occur after farrowing such as puerperal septicaemia and toxaemia (mastitis-metritis-agalactia syndrome, a bacterial infection of the udder and/or the womb). 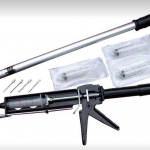 Routine treatment of adult pigs should be carried out every six months, and if possible either moved to clean pasture or their accommodation steam cleaned. Sows and gilts should be treated 7-14 days before farrowing. Gilts should also be treated 7-14 days before going to the boar. 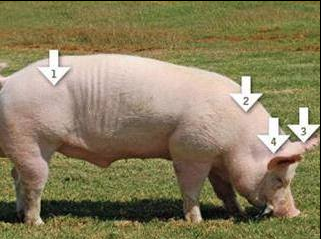 Ensure you make sure that you know the weight of your pigs so you can administer the correct dosage. Doramectin 10mg/ml: Intramuscular injection at a rate of 1ml per 33kg. For all gastrointestinal round worms, lungworm, lice and mites. 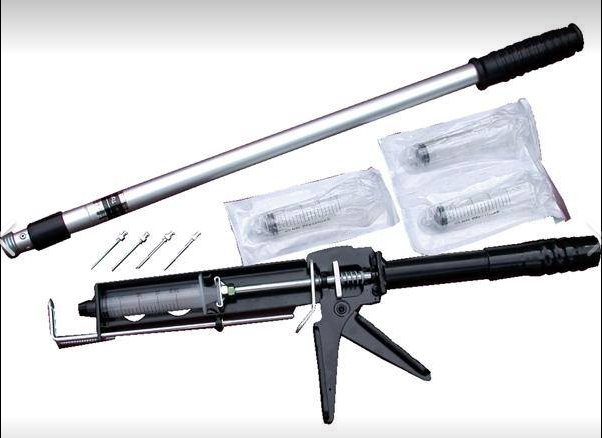 The product should be injected in the neck using 16-18gauge needle 2-2.5cm in length. Meat withdrawal: 56 days. Fenbendazole 100mg/ml: Oral preparation given at a rate of 0.5ml per 10kg divided over 7 days. For treatment of gastrointestinal round worms (except strongyloides) and lungworms. Can be given with food and/or diluted with water to increase volume. Meat withdrawal: 3days. 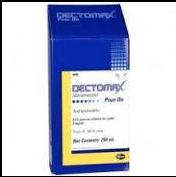 Dectomax injectable solution is for the treatment and control of gastrointestinal roundworms, lungworms, kidney worms, sucking lice and mange mites. 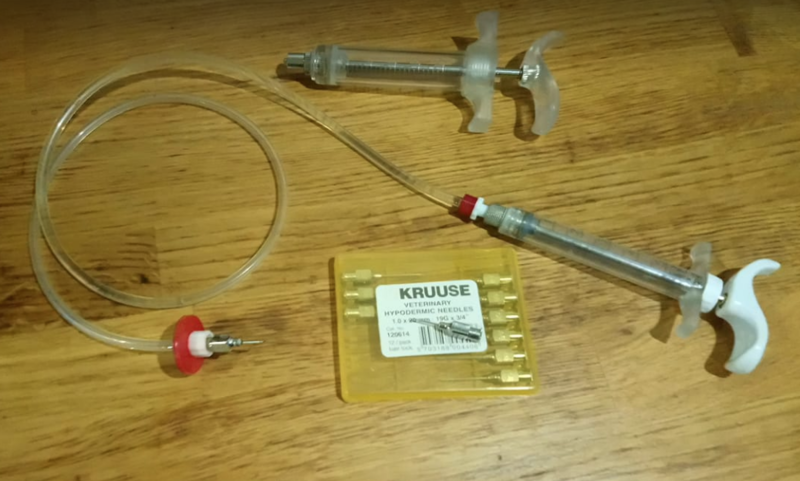 Inject in the neck region using an 18 gauge x 1” needle for young animals; a 16 gauge x 1-1/2” needle for sows and boars. Piglets, use of a 20 gauge x 1” needle. Meat withdrawal: 24 days. Then there is needle length and size. 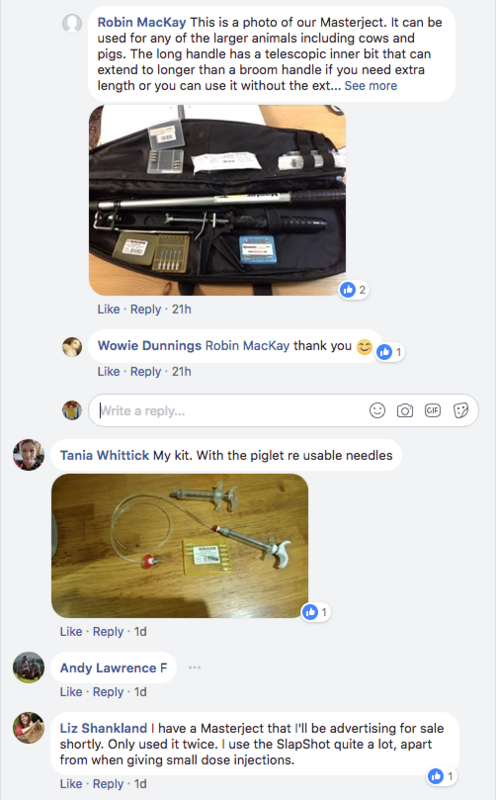 needle for more than 10 – 12 pigs (one litter). Then what applicators do we use. 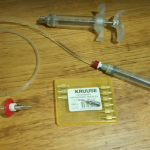 Some of use the normal syringe and needle, then there are the various gun applicators, the masterject auto injector and the slap shot we all have our preferences but in all cases keep them clean, safe and locked away. Don’t forget to speak to your vet first.